Hillary Diane Rodham Clinton is an American politician who was the 67th United States Secretary of State from 2009 to 2013, U.S. Senator from New York from 2001 to 2009, First Lady of the United States from 1993 to 2001, and the Democratic Party's nominee for President of the United States in the 2016 election. Born in Chicago and raised in the suburban town of Park Ridge, Illinois, Clinton attended Wellesley College, graduating in 1969, and earned a J.D. from Yale Law School in 1973. After serving as a congressional legal counsel, she moved to Arkansas and married Bill Clinton in 1975. In 1977, she co-founded Arkansas Advocates for Children and Families. She was appointed the first female chair of the Legal Services Corporation in 1978 and became the first woman partner at Rose Law Firm the following year. As First Lady of Arkansas, she led a task force whose recommendations helped reform Arkansas's public schools, and served on several corporate boards. As First Lady of the United States, Clinton led the unsuccessful effort to enact the Clinton health care plan of 1993. In 1997 and 1999, she helped create the State Children's Health Insurance Program. She also tackled the problems of adoption and family safety and foster care. At the 1995 UN conference on women (held in Beijing), Clinton stated in a then controversial and influential speech, that "human rights are women's rights and women's rights are human rights". Her marriage survived the Lewinsky scandal, and her role as first lady drew a polarized response from the public. Clinton was elected in 2000 as the first female senator from New York, the only first lady ever to seek elective office. Following the September 11 terrorist attacks, she voted to approve the war in Afghanistan. She also voted for the Iraq Resolution (a vote she later said she regretted). She took a leading role in investigating the health issues faced by 9/11 first responders. She further voted against the Bush tax cuts, and against drilling in the Arctic National Wildlife Refuge. She was re-elected to the Senate in 2006. 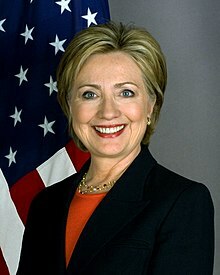 Running for president in 2008, she won far more delegates than any previous female candidate, but lost the Democratic nomination to Barack Obama. Clinton made a second presidential run in 2016. She received the most votes and primary delegates in the 2016 Democratic primaries, and formally accepted her party's nomination for President of the United States on July 28, 2016, with vice presidential running mate Senator Tim Kaine. She became the first female candidate to be nominated for president by a major U.S. political party. As part of her 2016 platform, she emphasized raising incomes, improvements to the Affordable Care Act and reform of campaign finance and Wall Street. She favored allowing pathways to citizenship for undocumented immigrants, combating climate change, expanding and protecting LGBT and women's rights, and instituting family support through paid parental leave and universal preschool. However, a controversy relating to a privately hosted email server during her tenure as Secretary of State became a significant issue, including in the closing days of the campaign. On November 8, 2016, Clinton lost to Republican rival Donald Trump, failing to obtain the necessary 270 votes in the electoral college, despite receiving a plurality of the national popular vote. It was the fifth US presidential election where the candidate who received the most popular votes did not win the election. Hillary Clinton (Kate McKinnon) announces she's running for president in a social media video co-starring her husband, Bill Clinton (Darrell Hammond). Presidential candidate Hillary Clinton admitted to Ellen that she tried to get out of going to the inauguration.